You can call this blog-post redundancy, or a shameless attempt at SEO optimization, but we”ve whittled down the list of browser themes from last week’s post to the Sweet 16. 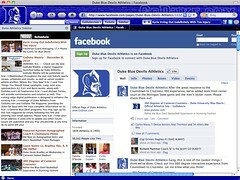 Actually, the Sweet 11 – some schools are behind on the browser front. So, unless you’re using the Bracket Madness browser theme, that covers the tournament as a whole, you’ll need a theme that suggests your bracket is intact. Get one of these today.